Click to collect 100% up to 1200€ Bonus + 50 Free Spins! 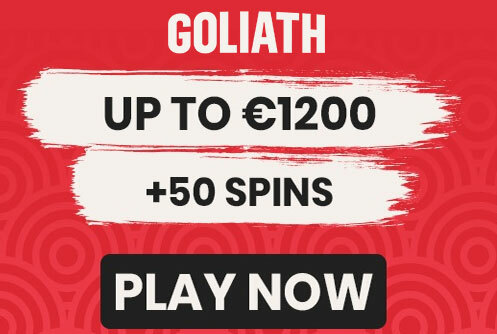 Get started with Goliath Casinos great welcome offer that gives you up to $1200 and 50 free spins. With plenty of fun games from start, everyone will find something of their taste and character. Goliath invites you to have your voice heard and what you would like to see more of as they just launched. That is always highly appreciated when Casinos invite everyone to get their best experience and favorites games added. More to come for sure. 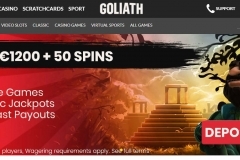 Goliath Casino is an online casino where members can enjoy a selection of games ranging from slots and jackpot games to table and live games. Members can choose from multiple gaming platforms too which include the likes of NetEnt, Microgaming, Play’n GO, Big Time Gaming, and NeoGames. The site can be reached in several languages like English and Deutsch and can be played instantly or on the go. 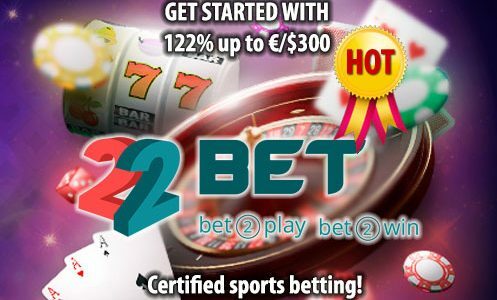 WELCOME OFFER FOR NEW PLAYERS: Get started with our great welcome offer that gives you up to $1200 and 50 bonus spins. Claim 100% Match Up up to $200 when you deposit minimum $20 +10 extra spins! 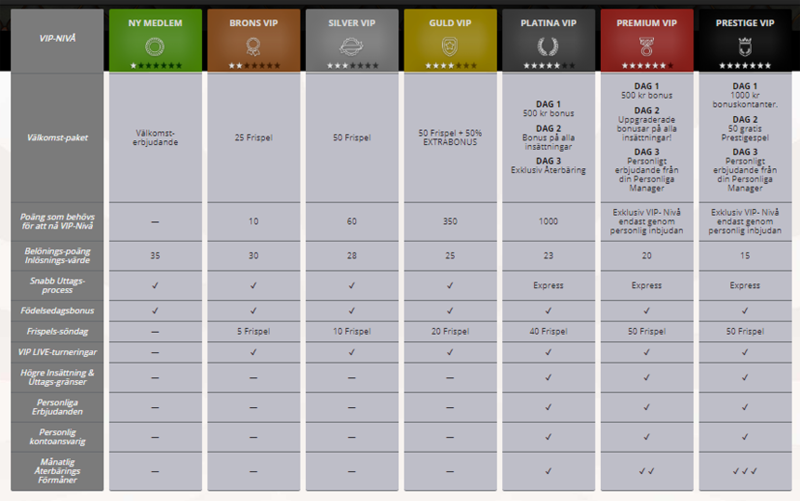 The wagering requirements for the welcome bonus are set at x35. That means that withdrawal requests can only be made once the bonus has been wagered at least 35 times. 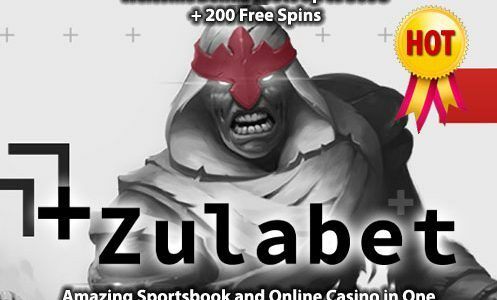 Wagering requirements might be a player’s least favourite part of accepting a bonus but at x35, Goliath Casino has kept this within the average range for the industry at the moment. A tiered VIP program awaits at Goliath Casino. What’s particularly appealing about this VIP system is that it rewards players of all levels and budgets, not just the high roller. 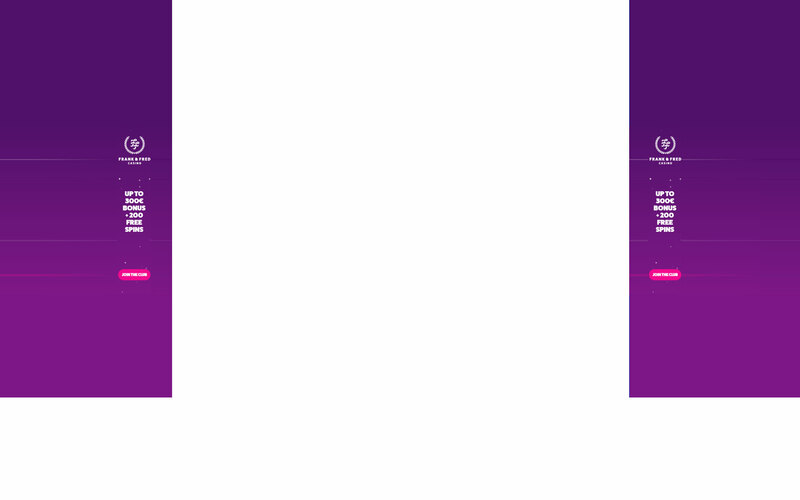 Start off as a new player and work you way up through the ranks, to reach the top tiers of the program at Platinum, Premium and Prestige VIP levels. The higher the level, the better the perks you receive. Progress through the levels by playing casino games and earning points. Each level requires a specific number of points to move on up. VIPs can look forward to faster withdrawal processing, a better exchange rate on reward points, a birthday bonus, free play on Sundays, higher deposit limits, access to VIP tournaments and promotions, and more! Players who enjoy video slots can enjoy hundreds here from some of the leading providers in the industry like NetEnt, Microgaming and Play’n GO. 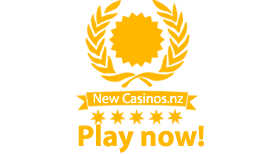 Members can also make browsing and pin-pointing games quicker by using the casinos in-built search engine. Titles include the Gonzo’s Quest Slot, Fruity Friends Slot, Sea Hunter Slot and Ted Slot. When it comes to table games players can pick from a small variety of blackjack and roulette games including Roulette Pro. There are also some video pokers available for players who prefer betting with cards. These include Jacks or Better and Joker Poker. Other games include a selection of scratch cards. Members who like betting with live dealers can enjoy games that are open around the clock. Hosted by friendly dealers, players can enjoy games like Live Blackjack, Live Roulette and Live Baccarat. 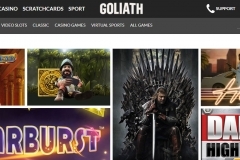 Fire up your smartphone because Goliath Casino is ready! Visit the casino URL in your mobile browser to enjoy your favourite mobile games on the go. All of the Goliath Casino site is mobile-friendly, with intuitive touch control and thoughtful design that mean that a smaller screen doesn’t necessarily mean a diminished casino experience. Enjoy over 100 mobile-compatible titles at Goliath, with more on the way as game providers push towards making as many of their game products suitable for mobile play. 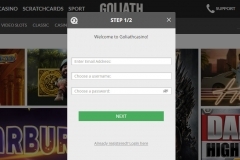 There is no downloadable app available for Goliath Casino, on either mobile or desktop. Still, we don’t feel this takes away from the casino experience. This casino has gone to great lengths to ensure that it looks great on any screen and the instant play option is a player favorite. Members who need assistance can use the casinos live chat facility which is available 8am to 1am, 7 days a week. Any concerns can also be sent by email or support can be reached over the telephone too.